I am not a McLaren supporter, nor am I a Ferrari fan. If I have a favorite team at the moment, it has to be BMW, and that is mainly because their car is the prettiest this year, in my humble opinion. 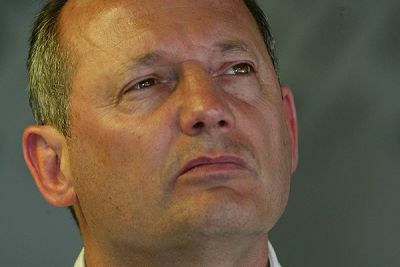 But I admit to a tendency to believe Ron Dennis in the current battle of words over the Ferrari documents affair. Not that it matters what I think; in due course the several courts involved will reach their conclusions and, hopefully, that will be an end to the matter. In the meantime, however, it is inevitable that our personal preferences will affect the way we feel about it. Ferrari supporters are convinced that McLaren were involved in dirty dealings at the crossroads, McLaren fans are equally sure that the real culprit is Ferrari. It is tempting to echo Alianora la Canta's comment on F1 Fanatic's post, Furious Dennis accuses Ferrari of cheating: a plague on both their houses. But I cannot do so; as I said, I tend to believe Ron. It's a matter of style, you see. Whereas Jean Todt has allowed his emotions to lead him into accusations against both McLaren and the WMSC, Ron has kept quiet until Max Mosley gave in to pressure and allowed the WMSC decision to go to appeal. It seems a bit unfair to accuse Ron of stirring the pot when it is obvious that he has been driven to answer the slurs made against his company. Like Bernie Ecclestone, I wish this one would just go away and let us return to racing. But, as long as we remain so fascinated by scandal and intrigue, the details will be argued over again and again. Even though Ron's letter has provided us with a lot more data to debate, we are still in the position of having to believe one side or the other; to make judgements without really knowing what is true, in other words. As has been said several times in the forums, this one will run and run. We can hope that the Appeal Court will settle the matter once and for all but that isn't necessarily so. Whichever side we happen to take, the ultimate verdict might seem unfair and debate continue. I still feel that the mass dampers banning of last year was a dubious decision, for example. It may be a long time before we can say of the espionage matter that it is "water under the bridge". There is one aspect that all sides seem to be agreed upon, however. And that is that Stepney and Coughlan deserve to have their backsides kicked mercilessly for having started the whole thing at all. Thanks to their foolish behavior, the sport is being revealed as a much dirtier business than we ever suspected. I would much rather my illusions were left intact, thank you very much. I too would rather believe "The Ron" in this matter. I personally like Ferrari over McLaren on the track but in this case Dennis seems to make more sense. I have written my two cents on F1 Fanatic. I think the only fair way to solve this is to let it be decided on the track. After 10(?) races, all four are contenders for the title, just as they were at the begging of the year. In fact Ferrari would probably be leading the championship if it wasn't for there unreliability. Maybe Ferrari should have just given them the information so the Mclaren's would would DNF a few races too! Through all of this what I still find funny is that Speed is still considered the biggest joke in the sport. I say we should just say that it was all his fault, then there wouldn't be so much whining on the forums. BMW is my favorite too, personally i think the blue pinstripe down the side of the car is hideous. I like them for there no nonsense "lets just race" attitude. That good German efficiency, hey, Dan? BMW seem so focused and certain of what they're doing - very impressive for a team that hasn't been in F1 for very long. It will be great when they break the stranglehold on the championship of the top teams. You're right about the Ferrari documents making no difference to the competition on the track. Without all the fuss, things would be just as they are. Always defending Speed. Either your truly an American now or your a level headed unbiased European..... Must be an American. I too just find Ron an inherently more credible, believable character. Obviously, I've never met him, but from - in particular - Jo Ramirez's autobiography, I got the impression that he is an honest man. A deeply strange, and perhaps quite flawed man, but honest. I haven't read the biography, Patrick, so I have to go entirely on what I see and read. And Ron has always struck me as honest, even in the days when McLaren were winning everything in sight and I disliked them for making F1 so boring. He is efficiency above all else and has no need to make up fairy tales for the press. "I would much rather my illusions were left intact, thank you very much." A wise and noble approach. However it means we'll all have to go back to focusing on the racing, which in Hungary can be tedious as anything! Hungary's only ever interesting if someone who's in a really slow car gets in front and it becomes a question of "can anyone pass this guy". Like with Boutsen's surprise win in 1990.